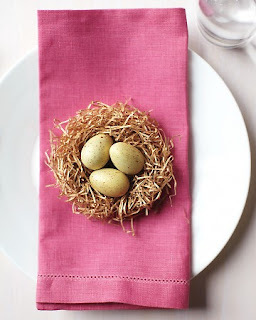 No need for meticulous cutting ~ a loose trim around the designs will do, as the napkins' edges will blend into the eggshells. Chipboard baskets, packed with the colorful creations and holiday sweets, are decorated with coordinating tags. Hot To: Blow Out Eggs- Pierce both ends of a raw egg using the tip of a sharp craft knife. Twist knife gently in holes to widen them slightly, with bottom hole a bit larger. Poke a straightened paper clip into the larger hole; pierce yolk, and stir. Hold egg, larger hole down, over a bowl. Insert the tip of a rubber ear syringe (available at drugstores) into smaller hole. Blow air into egg to expel its contents. Rinse egg with warm water; drain. Blow air into egg again. Let dry. Paper-Napkin Decoupage How-To: Trim loosely around the designs on a white napkin using small scissors. Separate printed top layer; discard lower sheets. Coat part of a blown-out white egg (or a white paper tag) with Mod Podge using a small brush. Apply 1 cutout design to egg (or tag); smooth with brush. Let dry. Repeat, adding designs as desired. 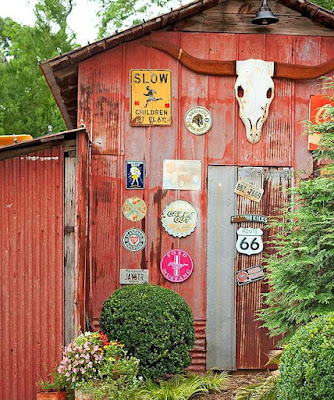 Apply Mod Podge with a medium brush to entire egg (or tag). Let dry. Use colorful printed fabric to create cheerful silhouettes in the shape of chicks, hens, and bunnies. How To: Cut mat board to 8 by 11 inches. Cover white side of mat board with Double Tack adhesive: Peel one corner of backing, attach to corner of mat board, and remove remainder of backing while smoothing onto mat board. Print bunny, bunny with cane, chicks 1 and chicks 2, or chicken template. Affix the template to the mat board with regular tape. Cut out the base, stands, and silhouette pieces. Peel backing off other side of Double Tack, and apply fabric to the silhouette, using a bone folder to smooth. Turn silhouette over, so mat board side is facing up, and cut off excess fabric with a sharp knife. 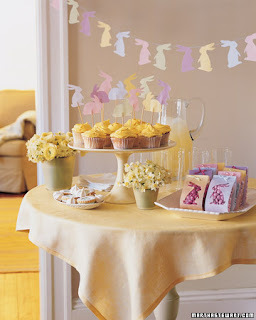 Affix Double Tack to decorative paper and cut out the shapes within the silhouette, represented by dotted lines. Peel off backing and apply the shapes to the fabric-covered silhouette. Affix silhouette to the base and stands using craft glue. To make the "grass," cut a piece of green paper an inch and a half wide by 11 inches long. Use shredding scissors to cut grass along the length of the strip. Wrap grass around base of silhouette, and affix with double-sided tape. 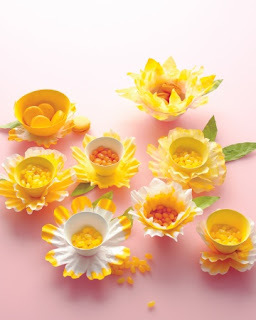 Fill base with candies, and embellish as desired. These cheerful paper bunnies multiply quickly, thanks to their simple construction.To bring some festive cheer to your dessert table, march the rabbits across a garland, sit them atop cupcakes, or use them to offer sneak peeks into gift bags. Garland How To: Download and print a rabbit template. Trace onto vellum; cut out shape. Punch 2 holes in head; thread with yarn. 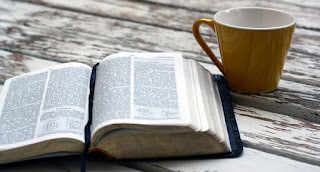 Repeat as desired. Gift bag How To: Cut an 11-by-2 1/2-inch strip of vellum. Position upright template so ears fall 2 1/2 inches below top edge. Trace; cut out. 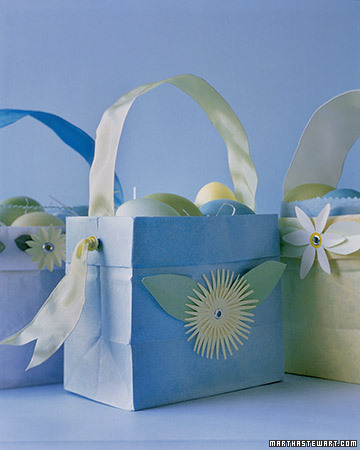 Fill 2 1/2-by-1-by-6-inch cellophane bags with favors, leaving about 2 1/2 inches empty. Wrap vellum around bag, fold top edges together, and punch 2 holes for ribbon tie. Cupcake topper How To: Trace template onto vellum; cut out. Repeat. Coat back of 1 rabbit and top 1/2 inch of a 6-inch bamboo skewer with a glue stick. Sandwich the stick between 2 rabbits. Dry between the pages of a magazine for 30 minutes. Create this table setting using a dyeing technique that requires little more than vinegar, oil, and food coloring. How To: In a small mixing bowl, combine 3 cups warm water, 2 tablespoons vinegar, and a few drops of food coloring. Place egg in dye, and leave it submerged until it turns the desired shade.In a wide, shallow bowl, prepare a second batch of dye (which will provide the swirls) in a darker shade or a different color. Liquid should be 1/2 inch deep. Add 1 tablespoon olive oil. Run a fork through this mixture, creating curlicues of oil on the surface.As oil swirls, place dyed egg in mixture, and roll it once around the bowl to pick up oil streaks; remove the egg.Gently pat egg with a paper towel.Let it dry. You can experiment with color combinations: Vary the base tints and the swirls to achieve striking contrasts, subtle shadings, or multihued richness. How To: Pour water with a few drops of food coloring into wide, shallow bowls. Dye a few filters completely green. Dip the open end of a larger stack in yellow. Remove, and let dry while stacked upside down. (Note: Coffee filters hold their shape best when dyed in a stack.) Paint cups with food coloring mixture. (Do some interiors, some exteriors, some both.) Separate dyed filters when dry. Fold 1 in half, and snip into fluted part every few inches. Trim snips into rounded petals. Unfold. Cut green filters into leaf shapes. Glue cup to center of filter. Glue green leaves to underside of filter. 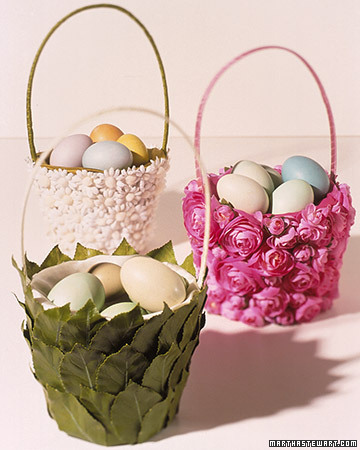 Dress up a woven basket with silk flowers and leaves, which you can find in most craft shops. A hot-glue gun is essential for this project. How To: Cut satin or silk fabric into a circle with a diameter three times that of the basket; line the inside of the basket with the fabric, tucking and gluing into place. Hot-glue a length of seam binding or ribbon at one handle end; wrap the handle with the seam binding, and affix with hot glue at the other end. Remove stems from the artificial flowers. Hot-glue the buds or leaves onto the basket, covering the entire surface. (When gluing leaves, work from the top of the basket downwards.) If you are using multilayered flowers like the pink ranunculus, you can pare down some of the buds to create a variety of sizes. 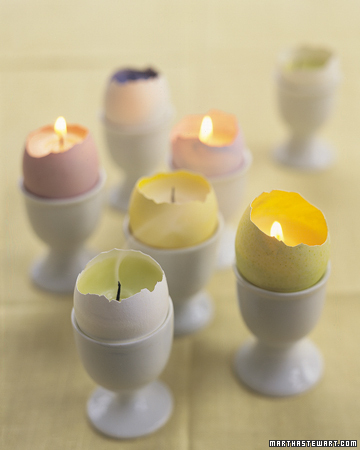 Everything is reborn in spring -- even Easter eggs, which can be transformed into votives for your table. Simple eggcups make a lovely base. 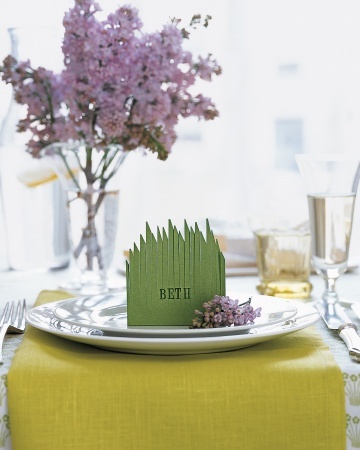 Celebrate the new season with place cards that resemble tufts of grass. How To: Cut a 3-by-4-inch rectangle from green card stock. On 1 short side, fold under 1 inch to create a base. Stamp or write a name on the place card. Using scissors, cut a series of grass blades, as shown, stopping about 1 inch from the bottom. To finish, make angled cuts along the top. How To:Cover the outside of a bowl with double-sided tape. Wind a ball of yarn (we used mohair) around the bowl until its exterior is hidden. To finish, securely tuck the loose end behind the wrapped yarn. 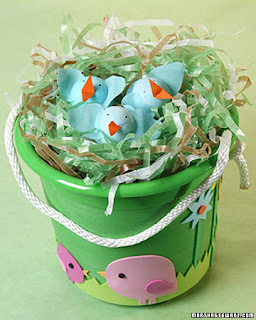 Why not replace your Easter basket with a plastic bucket in a spring color? 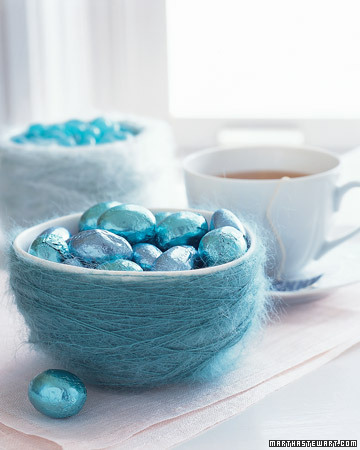 Just add Easter grass, candies, and some festive eggs. How To: Sand down the plastic bucket to give it tooth (which means making it slightly rough to allow the foam to stick better). 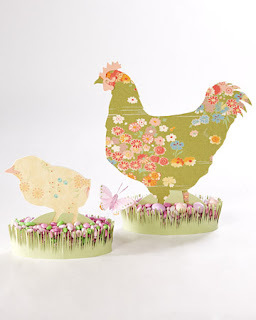 Using the template, trace chicks and flowers onto foam; cut out using scissors. Apply the glue to the foam. Press the chick and flower cutouts in place on the bucket.Egg Chick How-To: Start with a dyed Easter egg. To make the beak, fold a 1/2-inch square of crepe paper in half. 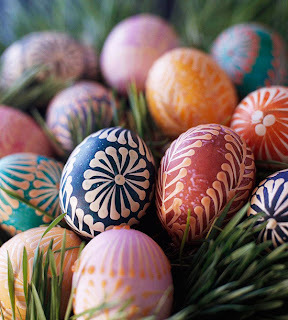 Then cut out a triangle, with the wide end on the fold; unfold and glue to the top of a dyed egg with craft glue. Cut 2 wing spaces from crepe paper (be creative! ), and glue each to the egg next to the beak. You're finished! Put your eggs in the finished Easter bucket on a bed of Easter grass and add candies, if desired. Welcome guests to the table with these cheerful fringed paper egg cups. How To: Cut an 8-by-1 1/2-inch strip from colored paper. Draw a pencil line down the length of the strip, 1 inch from one long side. Make a mark 4 1/2 inches from one end of the strip. Cut a 1-inch fringe with fringe scissors, using the pencil line as a guide, along the entire length of the strip. Using the tape roller, apply adhesive from the 4 1/2-inch mark to the end of the strip in the area that is not fringed. Coil the strip, creating a cylinder. Bend and fray the ends of fringe to look like grass. Tie a ribbon around the base of the cup. Use a glue gun to attach a butterfly on a wire or other embellishments (flowers, bumblebees, etc.) to the inside of the cup. 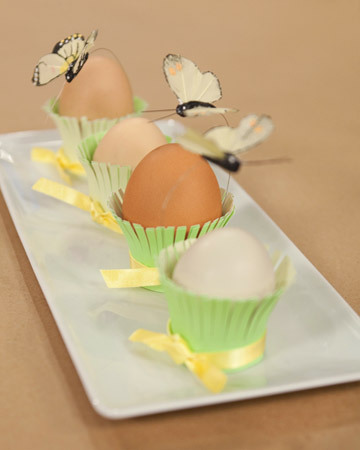 Write guest's name on hard-boiled egg with a pen or marker. Place egg in holder. Scoop up store-bought Easter basket staples to add this simple arrangement to your spring table. 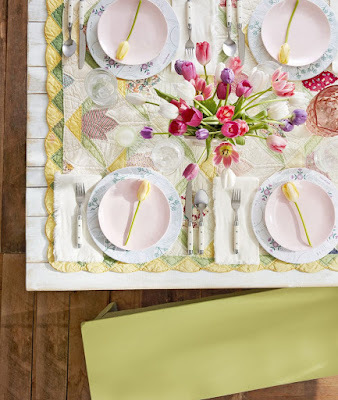 How To: Adding a whimsical touch to a springtime tablescape is as easy as scooping up store bought Easter basket staples and making a thoughtful arrangement. 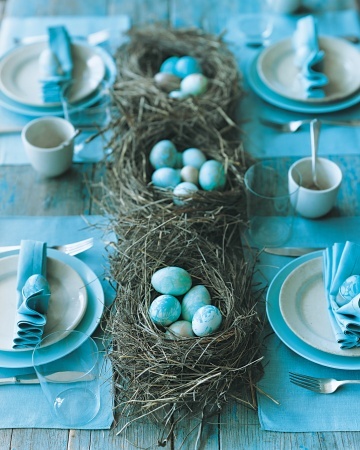 Handfuls of candy eggs and paper grass placed just so look like a bird's nest when perched atop each guest's plate. For an organic feel, we chose materials with natural tones, which will mesh seamlessly with linens in any color. 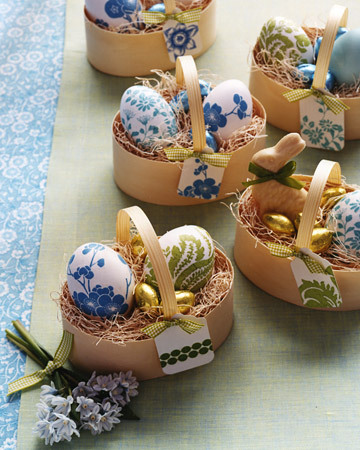 Wooden or plastic baskets filled with goodies are an Easter classic. 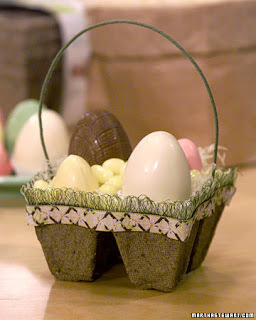 For an unusual variation on a beloved tradition, transform inexpensive peat pots into beribboned Easter "baskets" to use as favors.The tiny connected cells, commonly used for starting seeds, are ideal for holding jelly beans and small chocolate eggs. How To: Cut tray into 2 sections, one with 6 cells, the other with 4 cells. Create 2 holes in each tray, at the center of each side, for the handles. Cut an 18-inch length of wire (for the large tray) and a 13-inch length of wire (for the small tray). Insert wire into holes, creating a handle, and bend back ends with pliers to secure. Apply glue to each basket's top edge, and affix ribbon. 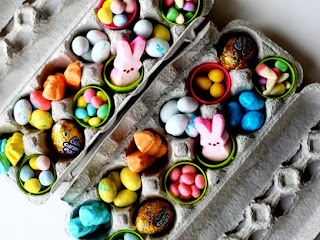 If desired, fill cells with Easter grass and candy. How To: Fold down the top of each bag four times, creating a 1 1/2-inch-wide band. Trace flower and leaf templates onto construction paper (or create your own shapes). Cut them out with a utility knife. Using a microhole punch or an awl, pierce the center of each flower, the base of each leaf, and the front of the bag, or its band. Arrange flowers and leaves on the bag so that all the holes line up. Push a metal eyelet through the holes from the outside of the bag in. Insert the eyelet post (included in the kit) into the back of the eyelet; hammer from the back of the eyelet until the eyelet flattens. Punch holes at each end of the band, and fit with the eyelets. Thread the wired ribbon through the holes; knot to secure, and trim the ends.